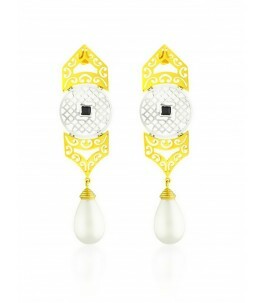 This exquisite set of earrings has a unique bell shape containing an intricate foliate pattern surmounted by a flower and suspending five drop shaped pearls in three ascending sizes. These earrings have a hanging loop. Mounted with pure 24 Karat Gold Plating on pure 92.5 Sterling Silver.